When it comes to choosing your picture perfect roof, there are a lot of options to choose from – metal, composition shingles, wood shingles, etc. However, two roofing options that leave your home with a beautiful style and a long-lasting durability are slate and tile. Slate and tile roofing are the perfect choices for your residence, whether you are creating an Italian or Mediterranean-inspired home, or you have a classic or modern home that you want to upgrade with a luxuriously-styled roof. Zenith Roofing has over 30 years of expertise and experience in slate and tile roofing. We will be happy to provide you with information on how you can apply this beautiful, distinctive style to your home. Originally, clay tile was imported from Europe. American-made tile was first manufactured in the mid 1600’s. Tile did not gain as much popularity as wood and slate shingles, in part because of economics as well as lack of acceptance by architects of the early 19th century. In residential roofing, there are two types of tile to choose from: clay and concrete. Concrete was primarily created as a less expensive method of providing tile, but the tile is usually thicker and heavier than clay. Concrete tile comes in a variety of colors, by mixing colored dye into the concrete. While clay tile is usually a variant of red or orange, it can also come in a variety of colors. The typical shapes that tile is available in are S-tile and Mission. Tile should be considered water-shedding and not waterproofing. For this reason, a waterproof underlayment is recommended. This can include multiple layers of felt or self-adhering membrane commonly called Ice and Watershield. Slate roofing has a long history in the United States, perhaps dating back to 1625 in Jamestown. Slate became popular because of its durability, appearance and fire resistance despite its higher costs. Roofing slate is dense, tough durable rock material that is impervious to most hail. Slate has three ratings S-1 (75-100 Years Service Life), S-2 (40-75 Years Service Life) and S-3 (25-40 Years Service Life). Prior to selecting slate, verify your roof has the structural capabilities to handle the weight load. Slate roof systems offer homeowners the opportunity to be creative with their residential roofing. Slate comes in multiple colors which can be mixed, resulting in a beautiful roof with character. Typical colors are grey, green and a reddish-purple. While some people choose all grey or all green, many people choose to mix the colors. However, when choosing to mix colors with your slate roofing, be sure to discuss with your roofer the quantities of each color, as well as visit slate roofs around your area and see which mix pattern you like best. Slate should be installed with a waterproof underlayment. Typical slate is installed with two nails at the top, but wire hangers can be used also. Slate can last well over 50 years, so all fasteners and metal flashings should be designed to last as long as the roof. Copper, stainless steel and lead are the most common accessories. Through the years, many companies have created synthetic tiles and slates in an effort to bring down the expense of clay tiles and slate as well as the structural weight requirements. These synthetics allow additional colors and shapes to be made. 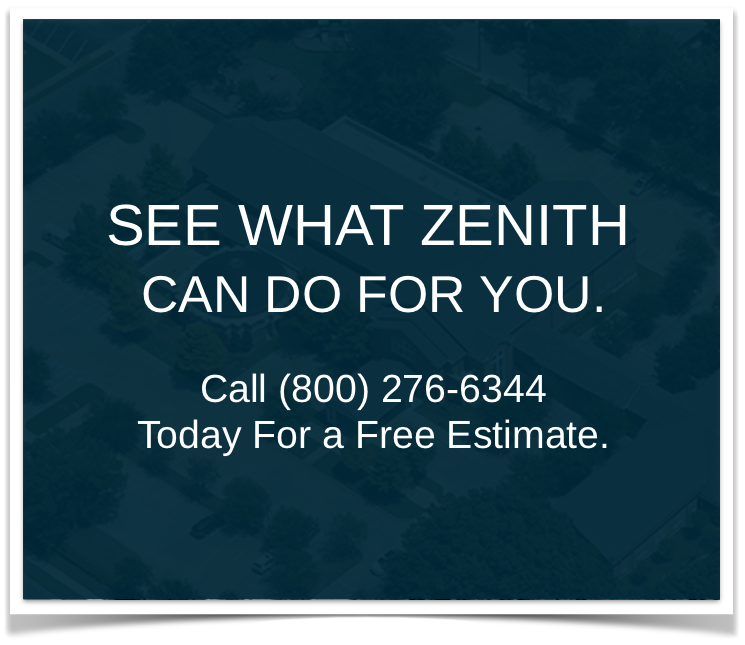 We suggest talking to a Zenith Roofing representative, to help find the best option for you. For more information about tile and slate residential roofing, and to receive an estimate on tile and slate roofing for your home, contact Zenith Roofing today by email at info@zenithroofing.com or by phone at 1-800-276-6344.